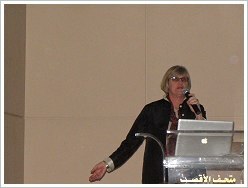 The Conference "In Search for New Concepts and Technologies for Conservation and Preservation of the Colossi of Memnon & The Mortuary Temple of Amenhotep III" took place at Luxor Museum from 3 to 5 March 2012. 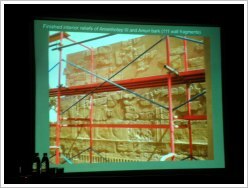 It was organised by The Ministry of State for Antiquities of Egypt, the Colossi of Memnon and Amenhotep III Temple Conservation Project and the University of Bamberg, Gernany, and funded by World Monuments Fund with a contribution by Mercedes Benz Egypt. 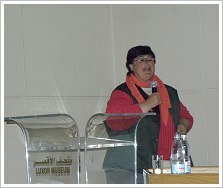 HE Mohamed Ibrahim Ali, Minister of State for Antiquities (MSA) himself gave a short opening speech, followed by Sanaa Ahmed Aly (Head of the Museums of Upper Egypt) and Mohamed El-Bialy ((Head of the Antiquities of Upper Egypt). 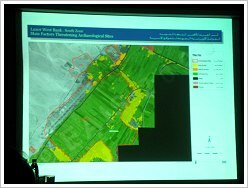 It was impressive to see and hear how international specialists from 14 countries work together constantly in order to obtain optimal results in documentation, conservation and reconstruction for the project at Kom el-Hettan. 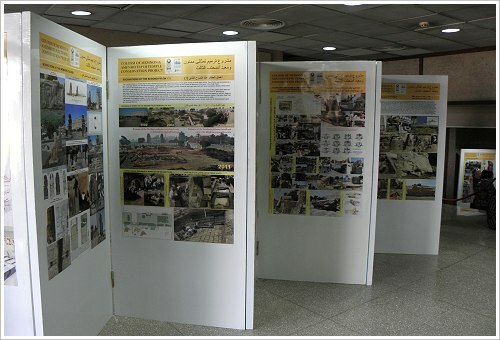 The 14-year-old pictures, taken when the project started, and latest pictures are poles apart. 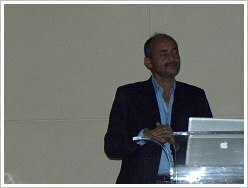 The public part of the conference programme was ambitious and diversified, the speakers were brilliant. 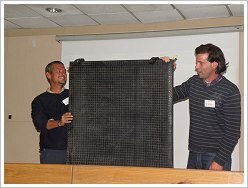 Below you find the list of speakers with their topics and short summaries of their presentations. 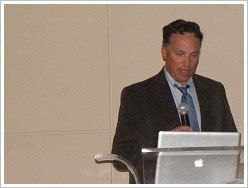 All rights of the shown presentation materials are reserved by speakers. 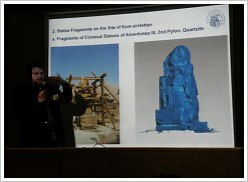 Hourig Sourouzian gave an overview of the excavation history of the Mortuary Temple of Amenhotep III. including all finds from huge fragments of colossal states through to tiny parts (see our news of 02/03/10, 22/03/10, 17/05/10, 02/10/10, 16/12/10, 27/04/11 and 31/05/11) like the beard of a red granite head of Amenhotep III which is in display at Luxor Museum. Meanwhile the beard was reattached. 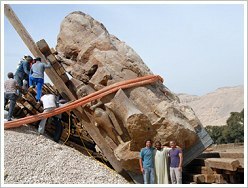 A new climax in the history of Kom el-Hettan was the re-erection of the 3rd Colossus of Memnon in February 2012. 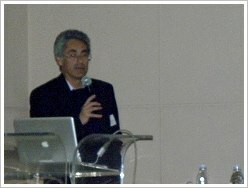 Hourig Sourouzian stressed that all statues, stelae etc. should remain in their original setting instead of being presented and taken out of content in museums at home and abroad. 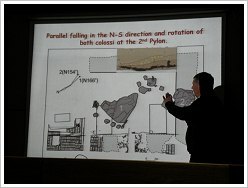 Rainer Stadelmann spoke about the Colossi of Memnon: about the origin of the used blocks of stone and about the difficulties to clean them from soilings with water, salt, fumes and bird droppings. 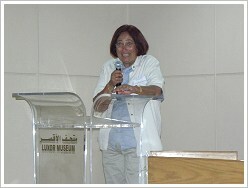 Nairy Hampikian aroused the vision of an Open-Air Museum at Kom el-Hettan. It will be a challenge because there is a large quantity of statuary but very little architecture - the stones were reused for other temples. 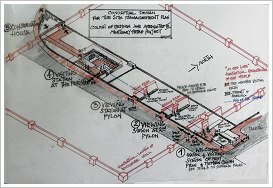 The conceptual design for the site management plan includes 5 visiting stations in the huge temple precinct: a welcoming and visiting station at the 2 well-known Colossi of Memnon at the 1st pylon, a viewing station at the 2nd pair of statues at the 2nd pylon, a viewing station at the 3rd pair of statues at the 3rd pylon, a visiting station at the peristyle and a viewing station at the rear of the temple where a museum and conservation house will provide a viewing platform on its roof. However, the first priority is an enclosure wall which protects the whole area. 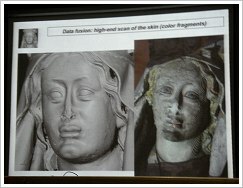 Using the example of the Bamberger Reiter and other artefacts from Franconian museums in Germany Rainer Drewello explained what 3D-technology is able to do - not only for documentation but also in order to reveal not visible remains of colours, engravings or inner cracks. 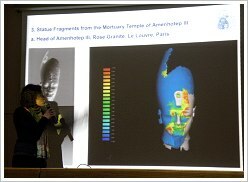 The two research assistants of the University of Bamberg showed up consecutively the abilities of even small 3D-scanners. They are able to record surfaces, identify structural similarities between various congenial objects and lay the foundation for the virtual generation and fabrication of missing statuary parts as well as for the replication of adequate materials that complete the statues. 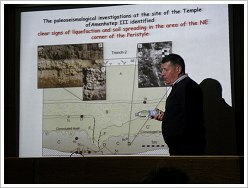 Initially, Arkadi Karakhanyan explained some basic terms of seismology like archaeoseismology, liquefaction and lateral spreading. 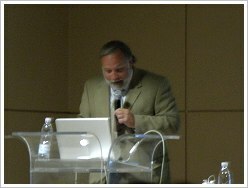 Then, he described the geological signs for past earthquakes using the example of Kom el-Hettan. 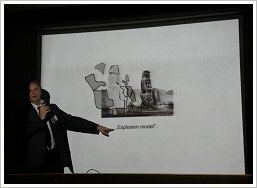 He simulated the collapse of the Colossi of Memnon by a strong earthquake that obviously happened between 1200 and 900 BC. 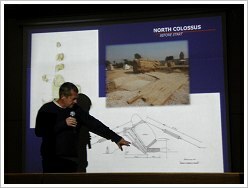 Miguel Ángel López Marcos described the original state of the 3rd (northern) Colossus of Memnon and particularised the lengthy process of moving, turning it in its original direction and lifting it by use of traditional methods like pharaonic workers did as well as modern technologies with compressors and air cushions. 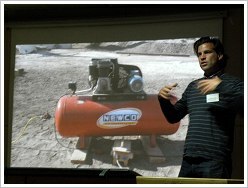 Christian Perzlmeier brought illustrative material, one of the used air cushions, and explained the mentioned modern mowing and lifting methods step by step. 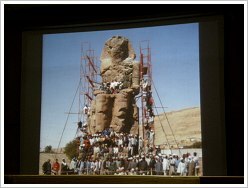 Mansour Boraik lively screened the state of the Avenue of the Sphinxes between Luxor Temple and Karnak Temple before restoration and now. He dwelled also on Luxor's Masterplan which included several bridges over the avenue. Instead, there will be guarded passageways through the accompanying walls every 600 metres which allow free access to visitors throughout the avenue. 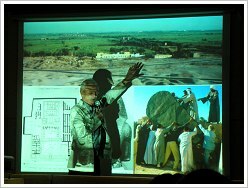 Betsy Bryan spoke about restoration work at the Temple of Mut situated southeast beyond the walls of Karnak Temple. 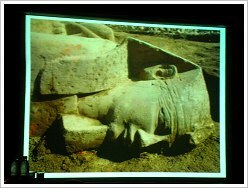 The archaeologists found numerous statues of Amenhotep III, specially statues of Sekhmet - although they don't bear any epigraphs archaeologists are confident of their provenience because of proportions and characteristic style. 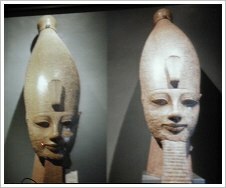 Amenhotep III. also built the enclosure wall around the Mut Temple and columns in front of pillars of Hatshepsut and Thutmose III. 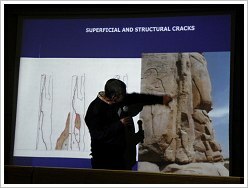 Raymond Johnson illustrated the lengthy restoration process and the emerging difficulties considering the example of the eastern wall of Luxor Temple: restoration of heavy damaged wall fragments, stabilisation of the wall by brick buttress, insertion of the blocks in their original location, optical additions of missing fragments by simple drawings. 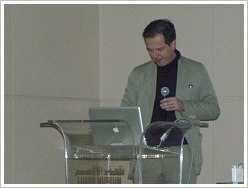 The lecture by Peter Lacovara purported the excavation, surveying and restoration work in Malqata, the former huge palace of Amenhotep III. 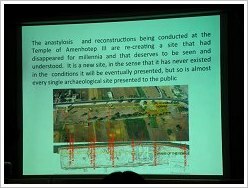 Horst Jaritz explained the clearing and restoration work at the Mortuary Temple of Merenptah, which is situated close beside Amenhotep III's Mortuary Temple. 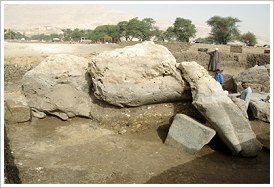 That's why many blocks of stones from Amenhotep III were usurped and used for Merenptah's temple. 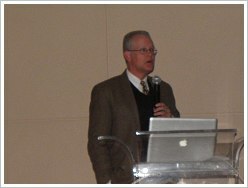 John Shearman spoke about the training of students in the field of documentation (photographs, drawings, descriptions, treatment proposals, and treatment reports), archiving documentation, restoration (wall and floor patching, flooring, making of walkways, lime slaking operations, laboratory work) and quality control. 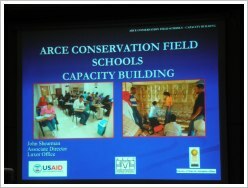 ARCE Field Schools had and have projects at Khonsu Temple in Karnak, at Luxor Temple (Ramses II court) and close to the Pasha House at the Corniche. New field school projects are the tomb of Djehuti (TT110) in Sheikh Abd el-Qurna and the Isis Temple at Deir el-Shelwit southwest of Medinet Habu. Hundreds of workers are involved in the diverse works at the temple precinct. As the situation demands high-tech and traditional methods are mixed. Every single fragment found is carefully documented and conservated - considering the quantity of material it's really remarkable. Tiniest fragments of monumental statuary are reconstructed with patience and persistence. 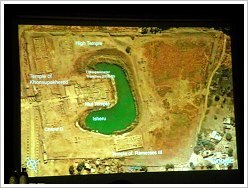 The effort to conserve and to present the site through monumental reconstructions is a challenge to a conservation philosophy prevailing today that favours minimal intervention approaches. 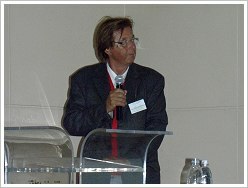 Gaetano Palumbo stressed the necessity of maintenance measures for the whole temple area. 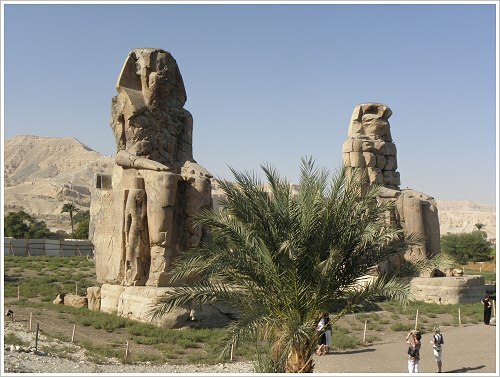 The times when the Colossi of Memnon stood solitarily in open fields with little trace left behind them of what was the largest morturay temple built in Egyot are a thing of the past. Also the romantic vision is lost as the colossi are encroached on all sides: The irrigation of adjacent farmland, the large coach park and the close street are a severe threat for the site. Necessary are: site monitoring, development of risk preparedness procedures (how should fire brigade behave in case of an accident to avoid further damage by water!?) and continuous site cleaning as preventive conservation. 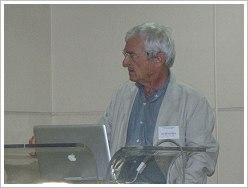 Julien Rathle explained meteorologic statistics. The data were collected at the Luxor International Airport and are not absolutely valid for Kom el-Hettan at the edge of the western desert. 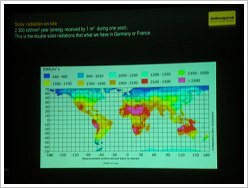 However, without doubt the climatic conditions are a challenge for the site. But an appropriate environmental design can cover the needs of cooling without installing a mechanical system (air conditioning) except in August.